FREE Hot Breakfast Buffet Includes: Scrambled Eggs, Waffles, Yogurt, Granola, Cereal, Juice, Coffee, Toast, Bagels and more. Dining: Award-winning Restaurant, Lobby Bar, Oyster Bar & Espresso Bar, Café Menu for light meals, Extraordinary desserts, breads, & muffins from the Senator Bakery. Recreation: Indoor salt-water heated lap pool, Outdoor heated pool (in season), Indoor & outdoor (in season) hot tubs, Saunas, Steam Room, Deluxe workout gym, Personal training appointments. Fitness classes also are available. Please find the Fitness Schedule here. Spa: Our award-winning on-site Spa offers: Massage therapy, Facials, Body Treatments, Pedicures & Manicures (by appointment) and our Spa Gift Shop features gifts for you or those back at home and a selection of makeup, skincare, nail and hair products. Meetings: Meeting and private dining facilities for up to 250 (with professional planners & pre-set or custom menus). 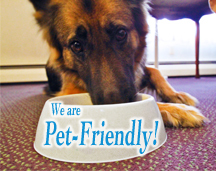 Pet Friendly Maine Hotel: Pets accepted – there is a $25.00 a night pet fee per pet. Misc: Fax, Photocopy & Fed-Ex business services and free USA Today or local newspaper (Mon.- Sat.). Check-in/Check-out: Check in time is 3 p.m. 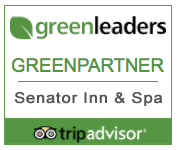 Although availability of rooms is not assured prior to 3 p.m., we will make every effort to accommodate you. Check-out time is 11:00 a.m. The current Maine State Lodging tax is 9%.